As the holiday season gets close we have been adjusting some of our most popular holiday gifts to make sure they smile even brighter this year. The personalized bracelets have always been a popular holiday gift for dads, husbands and brothers. 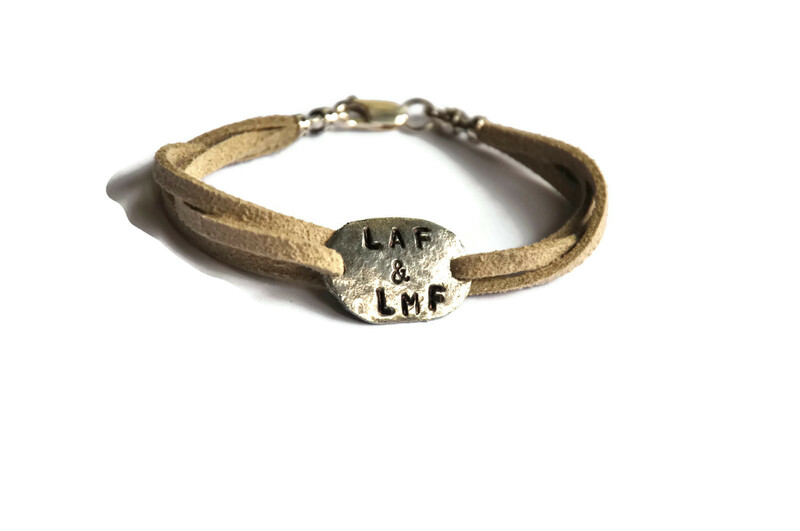 Customers can personalize their favorite and special names, dates, coordinates and symbols on a customizable palette of either silver or gold, and a selection of several suede colors. We are always striving to make our jewelry durable (especially for the men). After some great feedback we decided to swap out the eye hook with a super durable 14K gold or Sterling Silver lobster clasp that hooks on and wont EVER unhook. SWEET. The bracelet definitely looks pretty amazing now. We thank all our awesome customers for your amazing suggestions and can’t wait to make more of these custom, unique and heartfelt bracelets for the holidays. Posted in deals, Inside Etsy Shop Creations, MISC, stories of creating and tagged accessories, anniversary, art, artist, black friday, christmas gift, custom, cyber monday, dads, etsy, fashion, handmade, holiday gift, holidays, husband gift, los angeles, men christmas, mens, mens fashion, online sale, unique gift, xmas. Bookmark the permalink.